London housing market becoming similar to the rest of the UK? Surprisingly, this is a positive trend that shows promise for the future of the London housing market. The London housing market is well known for its profitability and new market trends to demonstrate the same. Interestingly enough some trends are showing the usually much higher London housing prices nearing the UK average. This is something UK investors have not seen in some time but it does not mean London is dropping, it means that the UK is rising. Along with the London and UK markets nearing close to each other buy to let properties are at a 14 month high, average house prices have risen by an average of 7.2% (London Datastore), and a drastic difference between 3 and 4 bedroom houses has been noticed. The graph above illustrates how the average rent of London is nearing the rest of the UK. As you may notice, London has consistently averaged higher percentages than the UK. 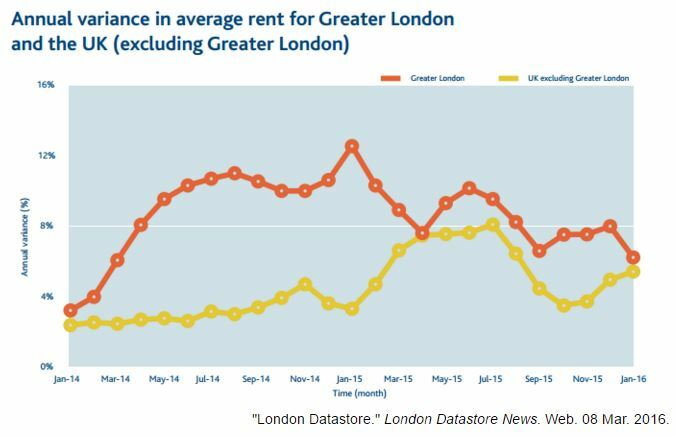 What is interesting to analyze is when there is a spike in the UK average rent, a spike in the London average usually follows shortly. For example, the Sep-14 to Nov-14 increase in the UK is followed by a spike between Nov-14 to Jan-14 in London. The UK spike in average rent between January and May of 2015 is also followed by a spike from March to July 2015 in the London market. This is not the first time that the two average have drifted together as the graph demonstrates. At the moment London is on a downward trend nearing the UK average. As trends have shown this is nothing to worry about. London investors can be excited to notice the increase of the UK average because a spike in the London average tends to follow. The graph below details this information further. As you can observe, the annual change as of Q4 in 2015 was an increase of 3.8% for the UK. For London, the annual change for Q4 2015 was 0.5%. 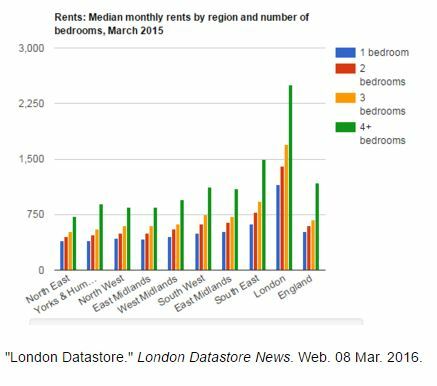 What is important to notice is both London and the rest of the UK are increasing in asking rent. This shows that London and the UK are both steady markets to invest in. London’s economic viability continues to rise as buy-to-let properties are at a 14-month high this January. 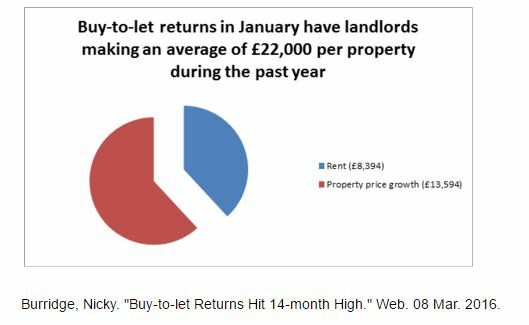 Landlords are currently making an average of £22,000 for each property in the past year. An average of £8,394 comes from rent and an average of £13,594 comes as the value of the property increases. Another appealing piece of information for London landlords is the price increase between 3 bedroom house and a 4 bedroom house. As the graph illustrates below, the calculated difference in rent between a 1, 2, or 3 bedroom houses is relatively similar. What is surprising is the drastic spike in median monthly rent for 4 bedrooms demonstrated in the graph below. This is an incredibly useful piece of information for landlords to use. If you may be considering restructuring an apartment to fit a 4th bedroom, this may serve as some inspiration to act. The London housing market is not stagnant, just like the rest of the world. It is important to analyze trends and patterns in order to understand and predict certain changes. The London housing market continues to be a strong place to invest. Over 75% of fortune 500 companies have an office in London, showing that London is one of the most powerful and influential areas in the world. By understanding the specific areas of investment within the field, buyers and sellers can act with confidence within the London housing marketplace.